Most of the time, note-taking is an urgent, spur-of-the-moment activity that demands a fast and efficient approach. For this, a smartphone app has to be simple enough so that the user can quickly jot down and save them, but also versatile enough for tasks other than just storing and viewing quick snippets of information. 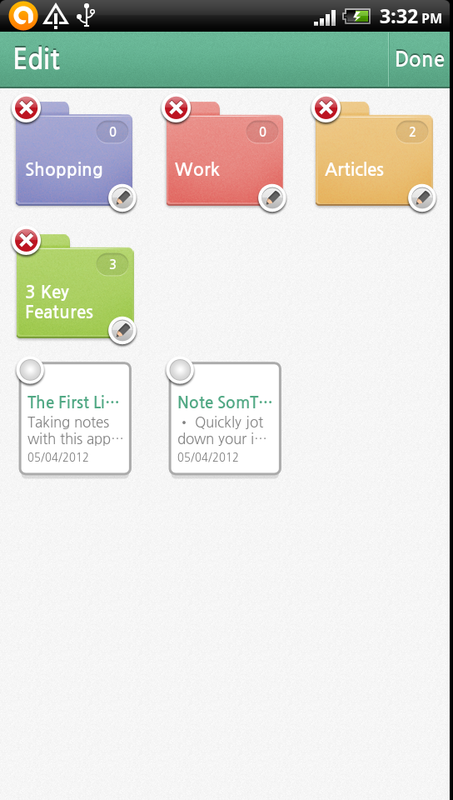 SomNote has great note organization features. With this app, you can create customized folders (by choosing a folder color and name) so that your notes are categorized and organized well. Tapping on the folder icon on the bottom left corner enables you to create a new folder, while holding down on an existing one will let you edit it. Most note-taking apps have a backup feature through cloud storage. SomNote has this feature too, but takes it further by providing a Recycle Bin. 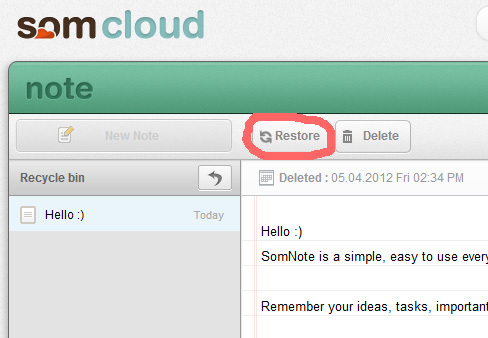 Deleted notes can be restored by going to the Recycle Bin on SomNote’s website. This feature requires you to registerÂ â€” registration is free and provides 100 MB of storage. 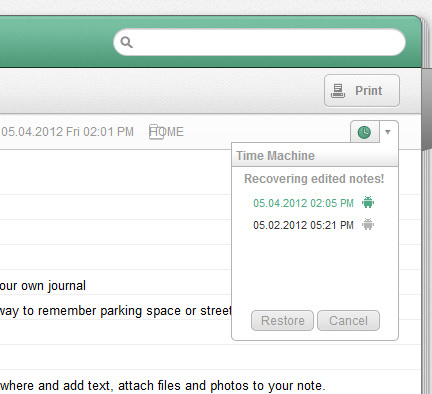 In addition to restoring deleted notes, you can also “go back in time” and restore a previous version of your notes. This can be done by logging in to the website and clicking on the Time MachineÂ button on the top right corner of the menu bar. 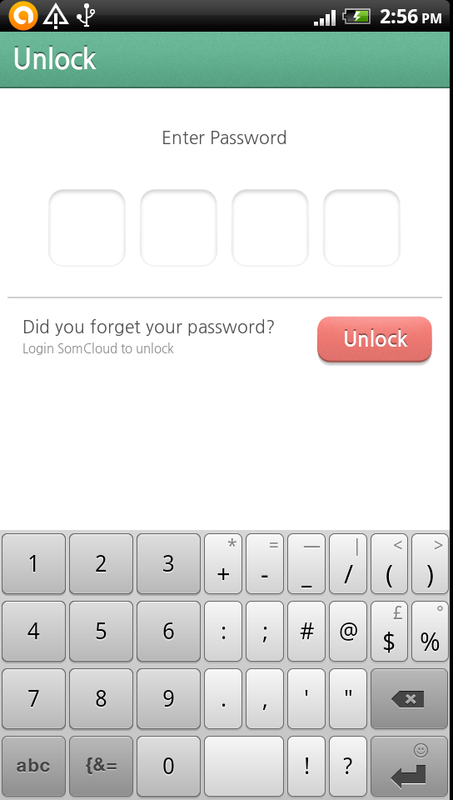 SomNote has a PIN lock feature to protect your notes. Enable this in “Settings” > “Lock.” Specify your four-digit PIN and the app will then require this PIN every time that you open it. This, however, is for the entire applicationÂ â€” so there is no option to assign a PIN to a specific note or folder. Like other apps, SomNote lets you attach photos from the camera or your SD card. In this regard, the app is very limited, since it doesn’t allow for any other media types other than photos. Let’s not forget the app’s main purpose â€” to take notes. Adding a note is done in one easy tap of a button. The interface is similar to that of a notepad, but with the text in a light gray color. This might not be ideal for some, but I find that it adds to the minimalist appeal of the app. Typing in a light text color also prevents others from “accidentally” reading your notes and keeps your writing as private as possible. The app has two types of views: Icon and List. This can be toggled by tapping on the View button in the top right corner. 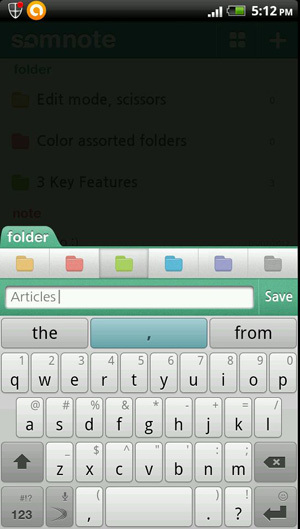 The Icon view gives a tiled array of folders and notes, which can be ideal of phones with bigger screens. The List view might be better for fitting all notes in the screen without having to scroll down. Another efficient feature is batch editing. This mode is enabled by tapping on the scissors icon. This creates additional buttons on folders and notes, allowing you to select more than one note at a time and perform an action, such as deleting, editing, or moving notes into a folder all as one large batch. You can exit this mode by pressing the Back key. There’s also a search function to look for notes using a certain keywords. This is something I don’t often see in other apps, and it can be a huge time saver if you have saved a lot of notes. SomNote’s greatest appeal is definitely its beautiful design and intuitive interface. 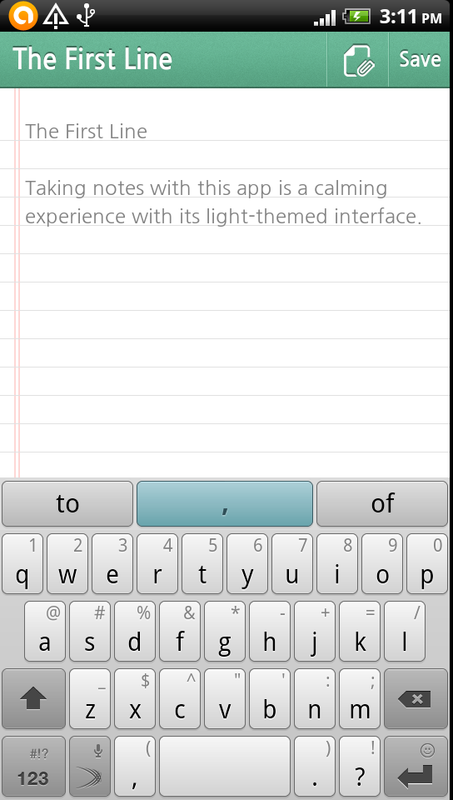 Although it’s not a fully-featured app, it does meet basic note-taking requirements. Simple, fast, and fun, this app is great for people who need write down their thoughts or ideas on a smart phone without any distractions or frivolous functions. Some features, however, could be improved. A note-specific or folder-specific PIN lock option would be a great addition in the future. Also, incorporating other media files like audio or video might also be another feature that most users would like. Although the mobile app is easy to use, I found myself struggling with the website interface, which required a bit of guesswork at first. This might be fine for advanced users, but it could be a challenge for a novice. Although this might not be that important for most people, a synchronized user experience for both mobile and web can make this app even more engaging and effective. The lack of multiple features can be a good or bad thing for the app, but that all depends on the user. Some users may be looking for the three main features of this app, so this should be enough for them. Overall, SomNote is an app for the visual writer who prefers a simple interface over a note-taking app with dozens of bells and whistles. Kim Barloso is a training officer for a BPO by profession and writes online in her free time. Kim is an Android fan and avid blogger of all things Android. When she's not busy blogging, she's probably hunting for the coolest apps in the Market.